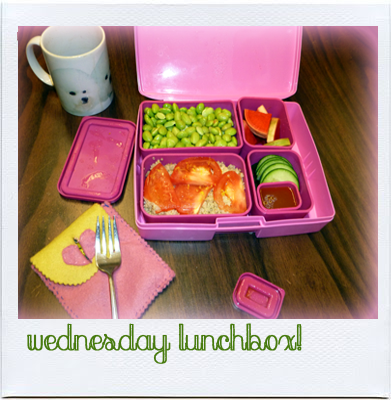 Introducing a new segment on The Salty Girl - Wednesday Lunchbox! Peep my lunchbox for new lunch ideas that are quick, healthy, seasonal and yummy. Let me tell you, having a great lunch to look forward to really makes your day interesting. Plus, it's a topic of conversation. People at the office have loved my lunches this week! This week's lunchbox has meyer lemon quinoa with cucumbers and tomatoes, edamame and umeboshi plum vinegar pickled watermelon radishes. Are you wondering what umeboshi plum vinegar is? What about watermelon radishes? Read on for more about this week's lunchbox! The meyer lemon quinoa is grain salad that is simply dressed with meyer lemon juice and zest combined with olive oil. Quinoa is a great grain for vegetarians because it has a fair amount of protein - 6 grams per serving. Grain salads are really great because they are quick to make and they are versatile and filling! Umeboshi plum vinegar is vinegar made from fermented plums. It's an unusual combination of salty and sour, and it's just delicious. I thought that umeboshi plums might be healthy for some reason, but Wikipedia just says that people claim it helps with digestion and fights bacteria. 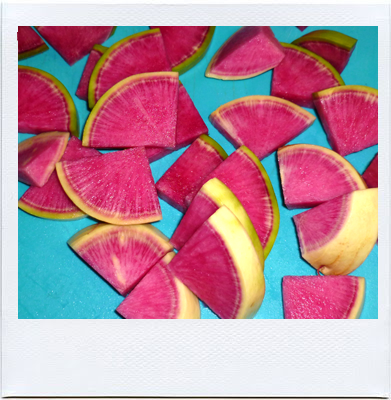 These radishes are spicy like a regular radish, but have the bright pink hue inside. I guess if I have to survive the winter, at least there is some form of watermelon to get me through. Watermelon radishes are a perfect vessel for a quick fridge pickle because they are crunchy and naturally peppery. All I did to pickle these radishes was to slice them up and put them into a jar with equal parts umeboshi plum vinegar and rice wine vinegar. They need the rice wine vinegar otherwise they are too salty. 1/2 of a tomato, particularly if you are making this in the summertime. I added it, but it's winter here and tomatoes are out of season and really don't taste good. Mine was pink and mealy. Rinse the quinoa in a fine-meshed strainer. Combine the quinoa and water in a medium saucepan and heat until boiling. Reduce the heat and simmer about 15 minutes or until the water is absorbed and the quinoa is fluffy and the little "tails" starts to come off of each kernel. While your quinoa is cooking, whisk together the lemon zest, juice and olive oil. Salt and pepper to taste. If you are going to eat it immediately, toss the dressing, quinoa and vegetables. I liked keeping my dressing separate in my lunchbox though, so I could pour on as much as I wanted, and I could also pour it over my edamame as well! Do you pack your lunch? Have you tried umeboshi plums or vinegar?